Dinosaurs once again roam the Earth in an amazing all-new game! 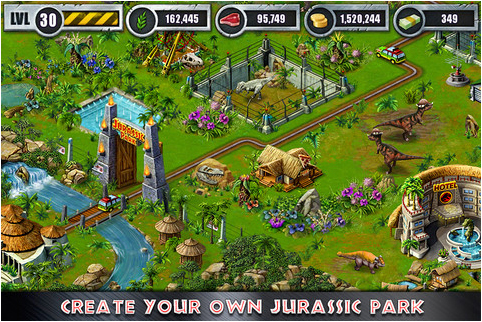 Interactive entertainment company Ludia Inc. has announced, in conjunction with Universal Partnerships & Licensing, the launch of the ‘Jurassic Park Builder’ game app for iPhone, iPad and iPod touch. Based on the ground-breaking film franchise, Jurassic Park, users will experience their own interactive journey on the mysterious Isla Nublar. Players have the chance to build their own Jurassic Park from the ground up! Park owners will nurture and grow various dinosaur species through the discovery of amber filled with dinosaur DNA. To turn the DNA into an egg, resources will be invested at the Research Center and once ready, eggs will be placed in the park and grow until they reach an adult size. To evolve, dinosaurs have to be fed plants or meat depending on their respective diets. Park managers will have to make sure their park is constantly fueled with enough goods to feed all the dinosaurs by managing the flow of imports at the port. Players will build roads for their visitors so they can go around and explore the park. To entertain their guests and collect more money, players need to be creative and decorate their parks by building various attractions and structures such as amusement centers, hotels, restaurants, and security offices. Throughout the gameplay, players will encounter familiar characters from the Jurassic Park movies such as, Dr. Ian Malcolm, or John Hammond, who will help players advance in their journey by giving them missions to fulfill. Every day, players will have the option to access the ‘Code Red’ mode, where time management skills will be put up to test. Players will need to act fast to keep dinosaurs from escaping and wreaking havoc on the island. Rated 4+, the ‘Jurassic Park Builder’ App is now available for free on the iTunes App Store™ for iPhone 3GS, iPhone 4, iPhone 4S, iPod touch (3rd generation), iPod touch (4th generation) and iPad devices running iOS 4.2 or later. This entry was posted on Friday, July 27th, 2012 at 9:50 am and is filed under Casual, Everyone, Mobile, National News, New Releases, Simulations. You can follow any responses to this entry through the RSS 2.0 feed. You can leave a response, or trackback from your own site.